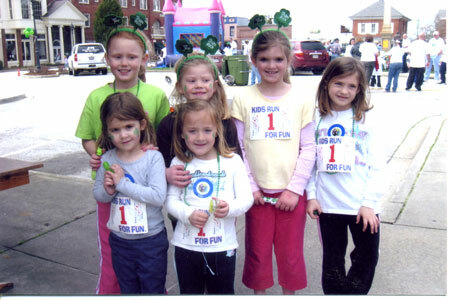 Participants in the 2011 Leprechaun Lap. Edgefield’s 7th annual Shamrock Run/Walk will be held this Saturday, March 16, in memory of Dr. Ned Nicholson and Dr. W. G. Watson. All proceeds will benefit the Edgefield County Hospital Auxiliary. Race starts at BiLo at 11 a.m. Those who have already registered can begin picking up their shirts and race numbers at 9 a.m. at BiLo. For late registration you can also register in front of BiLo for a cost of $20, but no shirt is guaranteed. Besides the fastest runners, male and female, in each category there will be other special prizes. On the square starting at 11 a.m., a Leprechaun parade will dance down Main Street to the square with the Irish Duck. Also in the parade will be the Queen of Leprechauns. This year the Queen is the one and only Pat McKie. MCs are Jane Herlong and Calvin Henderson. The restaurants on the square will be serving our favorites. Also on the square for the children there will be green cotton candy, drinks, cookies, face painting and the bouncing castle. The Leprechaun Lap will be for kids from ages 2 – 7. They may sign up on the square that day at a provided table. Every child is a winner. The Hospital Auxiliary will have a table of baked goods and give-aways all for charity. New this year is the Drunken Dunkin Leprechaun Booth for $1 per throw all for charity. Special people will be dressed as Leprechauns (Mr. Tim Williams is one). Come and dunk’em. The Best Dressed Looking Leprechaun contest is back this year with a $50 prize. And a wayward group of musicians, “The Shamrocks” will gather that day to play our favorite tunes. A reminder, winners of the race will be announced at 1 p.m. on the square. Please come and join the day of cheer and laughter in memory of two famous doctors.